Professor Xile Hu, an expert in catalysis at EPFL’s Institute of Chemical Sciences and Engineering, has been awarded the 2017 National Latsis Prize. This is the 34th award of the Latsis National Prize, and will be presented to Professor Hu by the SNSF on 11 January 2018, during a ceremony at Bern’s Hôtel de ville. Professor Xile Hu is recognized “for his impressive scientific career and his excellent research on the fundamental understanding of catalysis.” Catalysis is a branch of chemistry focused on substances that accelerate reactions or transform molecules. Professor Hu has distinguished himself by his pioneering research on the production of solar fuels, as well as on the synthesis of molecules with high added value. Chemist Xile Hu is the winner of the National Latsis Prize for 2017. Hu, a professor at the École Polytechnique Fédérale de Lausanne, was recognised for his outstanding scientific career and his original contributions to the fundamental understanding of catalysis. Catalysis is a field of chemistry that studies materials that can accelerate or bring about chemical transformations. Hu has distinguished himself through his pioneering work on the production of solar fuels and the synthesis of high-added-value molecules. The prize is awarded each year by the Swiss National Science Foundation (SNSF) on behalf of the International Latsis Foundation. Hu, who was born in China and came to Switzerland in 2007, founded the Laboratory of Inorganic Synthesis and Catalysis at the École Polytechnique Fédérale de Lausanne (EPFL). He is known for his innovative approach, which consists of combining the concepts and methods associated with three different types of catalysis (homogeneous, heterogeneous and enzymatic), which traditionally have remained separate. This approach has led to unprecedented understanding of fundamental catalysis and enabled the discovery of new catalysts with properties superior to those of previous materials. Accordingly, the 39-year-old Hu sought to model enzymes (enzymatic catalysis) as part of his research on solar fuels (heterogeneous catalysis). “It didn’t work, but we discovered a very good, new type of catalyst”, explains Hu. Half of his research team is working on solar fuels. “We use solar energy to split water into oxygen and hydrogen, because hydrogen is an excellent source of energy”, says Hu, who received his undergraduate degree in chemistry from Peking University. “We would like to use catalytic materials to store this energy in the form of chemical products.” Hu estimates that such a technology could become reality in 15 to 20 years. Research on high-value-added molecules for chemical products is Hu’s other major area of research. “We are focusing on catalysis based on elements that are abundant on Earth, like iron, copper and nickel”, says Hu, who did his postdoctoral research at the California Institute of Technology. “Until now, the chemical industry has mostly been working with precious metals like platinum, but these are rare and expensive. Abundant Earth elements are cheaper and have good potential, seeing as how they have been very little studied from that vantage.” These new molecules could later find use in the pharmaceutical, food-processing or even cosmetic industries. Xile Hu was born in Putian, in south-eastern China, on 7 August 1978. He is a professor at the Institute of Chemical Sciences and Engineering at the École Polytechnique Fédérale de Lausanne (EPFL). After receiving his bachelor’s degree in chemistry at Peking University in 2000, he left for the University of California, San Diego, where he received his master’s degree in 2002 and his PhD in 2004. He then did postdoctoral research at the California Institute of Technology in Pasadena from 2005 to 2007. That same year, he accepted a position at EPFL, where he went on to found the Laboratory of Inorganic Synthesis and Catalysis. He has received numerous prizes and distinctions, including the Werner Prize from the Swiss Chemical Society. Hu says he is “sometimes embarrassed that I don’t fit the cliché of the scientist who spends all his free time in the laboratory”. He enjoys skiing and hiking in the mountains. Hu is married to a Swiss acupuncturist, with whom he has a three-month-old daughter. Catalysis refers to the use of a substance to accelerate chemical transformations, or to bring about transformations that would not have occurred naturally. “Nearly 90% of chemical processes rely on catalysis at some point”, says Xile Hu, professor of chemistry at the École Polytechnique Fédérale de Lausanne (EPFL) and winner of the National Latsis Prize for 2017. “We would like them to enjoy even more widespread use, because a good catalyst makes it possible to avoid needless steps, in terms of cost as well as of time and energy.” Although catalysis is mainly employed in the chemical industry, it is equally important for humans and in nature. “Plants use biological catalysts for photosynthesis, whereas humans rely on enzymatic catalysis to metabolise the oxygen that they breathe”, says Hu. Moreover, anything to do with fermentation, such as the making of beer, yogurt or bread, depends on catalysis. Finally, the best-known catalysts are those used in cars. These catalysts transform engine emissions into non-toxic components that are then released into the air. Since 1983, the National Latsis Prize has been conferred annually by the Swiss National Science Foundation (SNSF) on behalf of the International Latsis Foundation, a non-profit organisation founded in 1975 and based in Geneva. It is awarded for outstanding scientific work by a Switzerland-based researcher under 40. With CHF 100,000 in prize money, the National Latsis Prize is one of Switzerland’s most prestigous scientific awards. There are also four University Latsis Prizes, each worth CHF 25,000, awarded by the Universities of Geneva and St, Gallen, and the Swiss Federal Institute of Technology in Zurich (ETHZ) and Lausanne (EPFL). The award ceremony for the 34th National Latsis Prize will be held at Berne Town Hall on 11 January 2018. Journalists can register by sending an email to: com@snf.ch. © Guillaume Petit-Pierre – Perfusion microdroplet allowing the extraction of interstitial liquid using the system developed by EPFL researchers. Researchers at EPFL have developed a new device and analysis method that let doctors measure the neurochemicals in a patient’s brain. The Microsystems Laboratory 4 (LMIS4)’s system involves collecting microdroplets of cerebral fluid and analyzing them to obtain chemical data that can help doctors diagnose and treat neurodegenerative diseases. Neurologists often use electrical impulses to stimulate and read brain signals. But the chemicals that neurons produce in response to these impulses are poorly understand at this point, even though they can provide valuable information for understanding the mechanisms behind neurodegenerative diseases like Alzheimer’s and Parkinson’s. “Neurons can be read two ways: electrically or chemically,” says Guillaume Petit-Pierre, a post-doc researcher at LMIS4 and one of the study’s authors. “Reading their electrical behavior can provide some limited information, such as the frequency and pace at which neurons communicate. However, reading their neurochemistry gives insight into the proteins, ions and neurotransmitters in a patient’s cerebral fluid.” By analyzing this fluid, doctors can obtain additional information – beyond that provided by neurons – and get a complete picture of a patient’s brain tissue metabolism. The EPFL researchers developed a system that can both collect a patient’s neurochemical feedback and form electrical connections with brain tissue. Their device is made up of electrodes and microchannels that are about half a hair in diameter. Once the device is placed inside brain tissue, the microchannels draw in cerebral fluid while the electrodes, which are located right at the fluid-collection interface, make sure that the measurements are taken at very precise locations. The microchannels subsequently create highly concentrated microdroplets of cerebral fluid. “The microdroplets form directly at the tip of the device, giving us a very high temporal resolution, which is essential if we want to accurately analyze the data,” says Petit-Pierre. The microdroplets are then placed on an analytical instrument that was also developed by scientists at the LMIS4 and the nearby University Centre of Legal Medicine which has expertise in this type of complex analysis. As a last step, the microdroplets are vaporized with a laser and the gas residue is analyzed. Both the researchers’ device and their analysis method are totally new. “Today there is only one method for performing neurochemical analyses: microdialysis. But it isn’t very effective in terms of either speed or resolution,” says Petit-Pierre. Another advantage of the researchers’ method is that it is a minimally invasive way to collect data. Currently scientists have to work directly on the brains of rats afflicted with neurodegenerative diseases, meaning the rats must be sacrificed to take the measurements. Their research was published in Nature Communications. For this study, the researchers focused primarily on the calcium, sodium, potassium and other ions in cerebral fluid. They worked with EPFL’s Neurodegenerative Disease Laboratory to compare the measurements they took on rats with those reported in the literature – and found that the results were well correlated. The next step will be to develop a method for analyzing the proteins and neurotransmitters in cerebral fluid, so that their implications in neurodegenerative diseases can be further studied. “Doctors could measure neurochemical responses to help them make diagnoses, such as for epilepsy, when they use electricity to measure signals from a patient’s cortex,” says Guillaume, “or to improve the efficiency of treatments like deep brain stimulation (DBS) for Parkinson’s disease.” Their research could also soon find direct applications in other medical fields. Guillaume currently works on a start-up project to develop a catheter for patients affected by hemorrhagic stroke. Based on a similar technology, his catheter would let doctors treat a common yet serious complication of this condition and thereby reduce the risk of death. This research was carried out jointly by EPFL’s Laboratory of Microsystems 4 (LMIS4), EPFL’s Neurodegenerative Disease Laboratory (LEN), the Unit of Toxicology at the University Centre of Legal Medicine (CURML, CHUV and HUG) and the University of Lausanne’s Faculty of Biology and Medicine (FBM, UNIL). An important breakthrough by EPFL researchers could lead to the discovery of a set of general laws applicable to the environmental sciences. Is there a link between a given species’ body mass and its abundance, or between the size of an ecosystem and its level of biodiversity? Ecologists often find that similar relationships of this type exist in different ecosystems. These relationships are called scaling laws, and they have been shown to apply in both marine and terrestrial environments and to various types of organisms (e.g., microorganisms, mammals and trees). But until now, no clear link has been drawn between these laws. 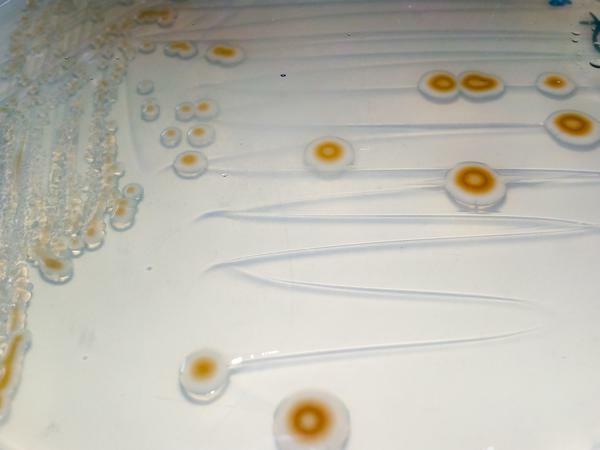 That is now changing: in a recent study, EPFL researchers proved the existence of common macroecological patterns exhibited by these ostensibly independent scaling laws. These patterns could even lead to the discovery of a set of general laws governing the environmental sciences. The study was recently published in Proceedings of the National Academy of Sciences (PNAS). The researchers began by testing their hypothesis on three sets of empirical data on tropical forests and communities of mammals and reptiles living on islands with similar climates. Using a computer model, they then replicated the laws that they had observed in the field and developed general algebraic formulas that tie them all together. “Our goal was to rationalize macroecological patterns observed in various ecosystems and position them in a unified framework from which they all derive,” says Silvia Zaoli. “In other words, we wanted to find their shared origin.” Zaoli is a PhD student at EPFL’s Laboratory of Ecohydrology (ECHO) and the study’s lead author. This study was supported by the Swiss National Science Foundation (SNSF). Of all the electricity produced in Switzerland, 56% comes from hydropower. The life span of hydroelectric plants, which are massive and expensive to build and maintain, is measured in decades, yet the rivers and streams they depend on and the surrounding environment are ever-changing. These changes affect the machinery and thus the amount of electricity that can be revised. EPFL’s Laboratory for Hydraulic Machines (LMH) is working on an issue that will be very important in the coming years: the impact of sediment erosion on turbines, which are the main component of this machinery. The laboratory’s work could help prolong these plants’ ability to produce electricity for Switzerland’s more than eight million residents. One of the aims of Switzerland’s 2050 Energy Strategy is to increase hydroelectric production. The Swiss government therefore also needs to predict the environment in which these power plants will operate so that the underlying technology can keep pace with changing needs and future conditions. “In Switzerland, the glaciers and snow are melting more and more quickly. This affects the quality of the water, with a sharp rise in the content of sediments,” says François Avellan, who heads the LMH and is one of the study’s authors. “The sediments are very aggressive and erode the turbines.” This undermines the plants’ efficiency, leaves cavities in the equipment and leads to an increase in vibrations – and in the frequency and cost of repairs. To top things off, the turbines’ useful life is reduced. Under the umbrella of the Swiss Competence Center for Energy Research – Supply of Electricity (SCCER-SoE) and with the support of the Commission for Technology and Innovation (CTI), EPFL has teamed up with General Electric Renewable Energy in an effort to better understand and predict the process of sediment erosion. The aim is to lengthen the hydropower plants’ life span through improved turbines and more effective operating strategies. With conclusive results in hand, the LMH has now moved on to the next phase, which consists in characterizing the materials used in the turbines. Following this step, the researchers will be able to apply the new model to existing hydroelectric facilities. The stakes are global when it comes to retrofitting turbines in response to climate change, as hydropower accounts for 17% of the world’s electricity production. Turbines offer little leeway and have to operate in a wide range of environments – including monsoon regions and anything from tropical to alpine climates. If turbines are to last, changes will have to be made to both their underlying design and how they are operated. “While I was evaluating a hydro plant in the Himalayas, my contacts there told me that if a turbine made it through more than one monsoon season, that was a success!” says Avellan. This study is part of CTI project No. 17568.1 PFEN-IW GPUSpheros. It was conducted in conjunction with General Electric Renewable Energy under the umbrella of the Swiss Competence Center for Energy Research – Supply of Electricity (SCCER-SoE). A multiscale model for sediment impact erosion simulation using the finite volume particle method, Sebastián Leguizamón, Ebrahim Jahanbakhsh, Audrey Maertens, Siamak Alimirzazadeh and François Avellan. Science Direct. EPFL scientists have developed a scanning transmission electron microscopy method that can quickly and efficiently generate 3D representations of curvilinear nanostructures. Physical and biological sciences increasingly require the ability to observe nano-sized objects. This can be accomplished with transmission electron microscopy (TEM), which is generally limited to 2D images. Using TEM to reconstruct 3D images instead usually requires tilting the sample through an arc to image hundreds of views of it and needs sophisticated image processing to reconstruct their 3D shape, creating a number of problems. Now, EPFL scientists have developed a scanning transmission electron microscopy (STEM) method that generates fast and reliable 3D images of curvilinear structures from a single sample orientation. The work is published in Scientific Reports. The labs of Cécile Hébert and Pascal Fua at EPFL have developed an electron microscopy method that can obtain 3D images of complex curvilinear structures without needing to tilt the sample. The technique, developed by EPFL researcher Emad Oveisi, relies on a variation of TEM called scanning TEM (STEM), where a focused beam of electrons scans across the sample. The novelty of the method is that it can acquire images in a single shot, which opens the way to study samples dynamically as they change over time. Furthermore, it can rapidly provide a “sense” of three dimensions, just like we would have with a 3D cinema. TEM is a very powerful technique that can provide high-resolution views of objects just a few nanometers across — for example, a virus, or a crystal defect. However TEM only provides 2D images, which are not enough for identifying the 3D morphology of the sample, which often limits research. A way around this problem is to acquire consecutive images while rotating the specimen through a tilt arc. The images can then be reconstructed on a computer to gain a 3D representation of the sample. The problem with this approach is that it requires extreme precision on hundreds of images, which is hard to achieve. The 3D images generated in this way are also prone to artefacts, which are difficult to remove afterwards. Finally, taking multiple images with TEM requires shooting a beam of electrons though the sample each time, and the total dose can actually affect the sample’s structure during acquisition and produce a false or corrupted image. In the STEM method developed by the researchers, the sample stands still while the microscope sends two beams of electrons tilted against each other, and two detectors are simultaneously used to record the signal. As a result, the process is much faster than previous TEM 3D imaging technique and with almost no artefacts. The team also used a sophisticated image-processing algorithm, developed in collaboration with Fua’s CVlab, to reduce the number of images needed for 3D reconstruction to only two images taken at different electron beam angles. This increases the efficiency of data acquisition and 3D reconstruction by one to two orders of magnitude compared to conventional TEM 3D techniques. At the same time, it prevents structural changes on the sample due to high electron doses. Because of its speed and immunity to problems with standard TEM methods, this “tilt-less 3D electron imaging” method is of great advantage for studying radiation-sensitive, polycrystalline, or magnetic materials. And because the total electron dose is reduced to a single scan, the method is expected to open up new avenues for real-time 3D electron imaging of dynamic material and biological processes. Six months after the Antarctic Circumnavigation Expedition ended, the teams that ran the 22 scientific projects are hard at work sorting through the many samples they collected. 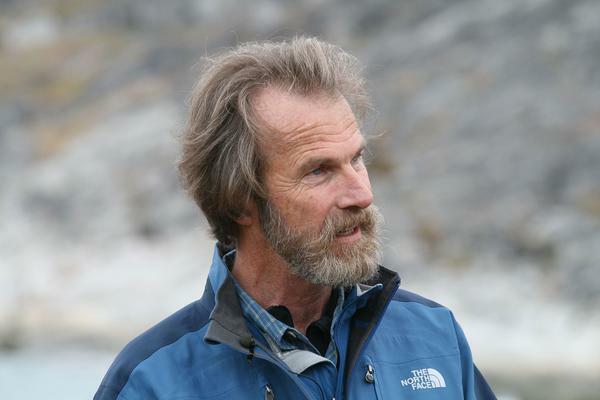 Some preliminary findings were announced during a conference in Crans Montana organized by the Swiss Polar Institute, who just appointed Konrad Steffen as new scientific director (see the interview below). Nearly 30,000 samples were taken during the Antarctic Circumnavigation Expedition (ACE). And now, barely six months after the voyage ended, the research teams tasked with analyzing the samples have already produced some initial figures and findings. These were presented in Crans Montana during a conference put together earlier this week by the Swiss Polar Institute (SPI), the EPFL-based entity that ran the expedition. The event, called “High altitudes meet high latitudes,” brought together world-renowned experts in polar and alpine research in an exercise aimed at highlighting the many similarities between these two fields of study. Over the course of three months – from December 2016 to March 2017 – 160 researchers from 23 different countries sailed around the Great White Continent on board a Russian icebreaker. They ran 22 research projects in an effort to learn more about the impact of climate change on these fragile and little-known regions. The valuable samples, taken from the Southern Ocean, the atmosphere and a handful of remote islands, are now back at the labs of the 73 scientific institutions involved in the expedition. 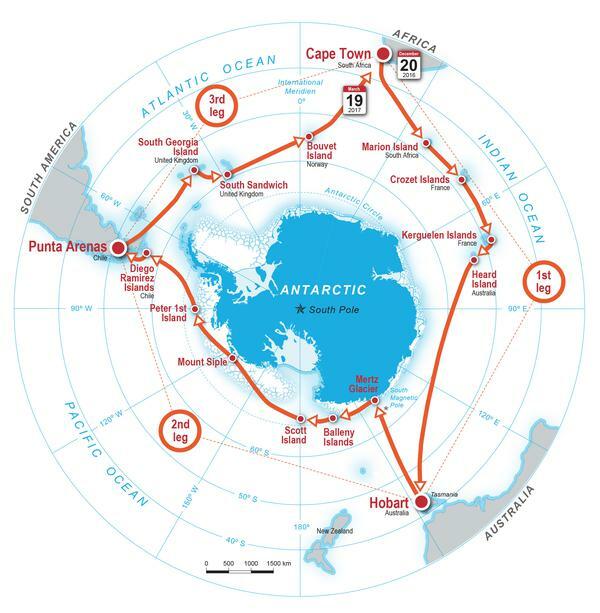 The route of the ACE expedition. Most of the teams that ran the 22 projects are still carrying out the preliminary task of sorting through and identifying the samples, which means the initial results are necessarily incomplete and provisional. It is only later that the samples will be analyzed. Some important observations can nevertheless be made at this stage. The sum total of the samples collected represents an impressive and valuable database. The SPI must now come up with ways to organize, group and present the data so that researchers can readily access and make use of it. What’s more, “the large number of potential collaborations and exchanges between projects is becoming clear,” says David Walton, the chief scientist on the expedition. “Some research projects have been found to have links with as much as nine others.” And some startling figures have already been released – here is a look at just a few of them. The air on the continent is so pure that even the hottest cup of tea does not produce any steam. “No particles, no clouds,” explains Julia Schmale, a researcher with the Paul-Scherrer-Institute who measured for aerosols – tiny chemical particles like grains of sand, dust, pollen, soot, sulfuric acid, and so on – throughout the expedition. These particles attach to water molecules and aggregate to form clouds. On Mertz Glacier, her measurements revealed aerosol levels below 100 particles per cm3, which is less than the level found in a cleanroom. Bacteria collected on the sedimental floor beneath Mertz glacier, on the Antarctic continent, as part of Christel Hassler’s project (University of Geneva). ©M.Fourquez. One of the subsequent lines of research will be to determine their geographical distribution. The researchers will be able to tell if there’s a link between the presence of a given bacterium and that of other microorganisms by comparing their data with data from other projects, like Nicolas Cassar’s. Cassar, from Duke University in the United States, measured concentrations of phytoplankton, which sit at the very bottom of the region’s food chain. “This approach worked out well, and we have nearly continuous samples from along the entire route,” says Walton. Brian Miller, from the Australian Antarctic Division, was interested in somewhat larger animals. For his project, he used a piece of sophisticated acoustic equipment to listen for and count the number of whales in the Southern Ocean. Walton notes: “In around 500 hours of recordings, the researchers counted for example over 3,000 individual blue whales, although we actually saw only three or so at the surface.” These cetaceans appear to be particularly plentiful in the depths of the Ross Sea. More complete and detailed results will be published in the coming months. 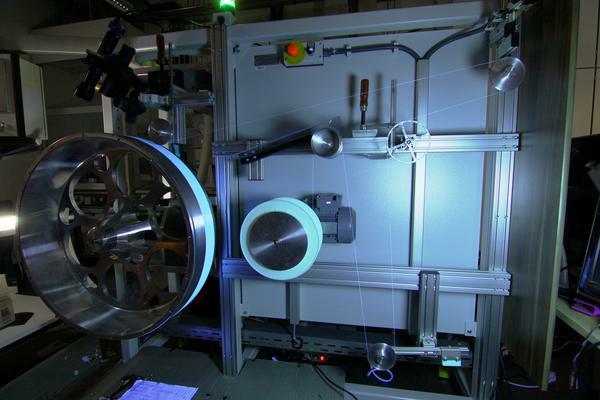 Construction of the tracker, which incorporates 10,000 kilometers of scintillating fibers each with a diameter of 0.25mm, has already begun. When particles travel through them, the fibers will give off light signals that will be picked up by light-amplifying diodes. 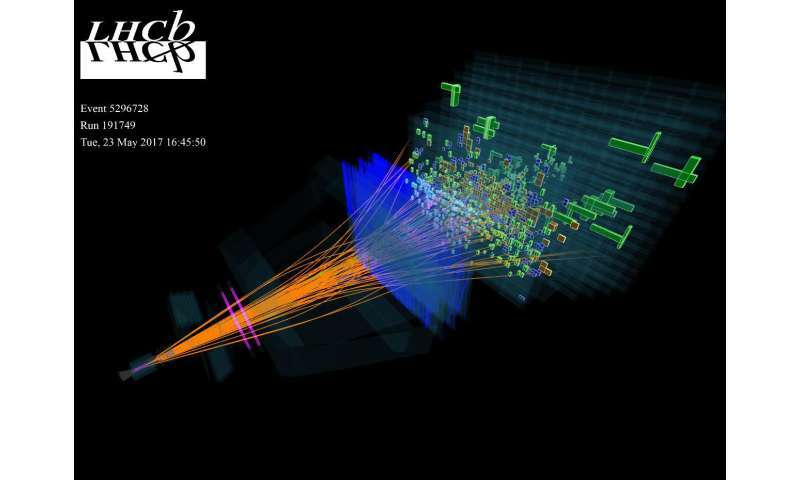 The scintillating fibers will be arranged in three panels measuring five by six meters, installed behind a magnet, where the particles exit the LHC accelerator collision point. The particles will pass through several of these fiber ‘mats’ and deposit part of their energy along the way, producing some photons of light that will then be turned into an electric signal. The Large Hadron Collider (LHC) at CERN, the European Organization for Nuclear Research, produces hundreds of millions of proton collisions per second. But researchers working on the Large Hadron Collider beauty (LHCb) experiment, which involves physicists from EPFL, can only record 2,000 of those collisions, using one of the detectors installed on the accelerator. So in the end, this technological marvel leaves the physicists wanting more. They are convinced that the vast volume of uncaptured data holds the answers to several unresolved questions. In elementary particle physics, the Standard Model – the theory that best describes phenomena in this field – has been well and truly tried and tested, yet the researchers know that the puzzle is not complete. That’s why they are studying phenomena that are not accounted for by the Standard Model. This quest for “new physics” seeks to explain the disappearance of antimatter after the Big Bang and the nature of the dark matter that, although it represents around 30% of the universe, can only be detected by astronomical measurements at this point. “To extract more information from the LHC data, we need new technologies for our LHCb detector,” says Aurelio Bay from EPFL’s Laboratory for High Energy Physics. EPFL has teamed up with several research institutes to develop the new equipment that will upgrade the experiment in 2020. Data on how the particles traverse the fibers will be enough to reconstruct their trajectory. The physicists will then use this information to restore their primitive physical state. “What we will essentially be doing is tracing these particles’ journey back to their starting point. This should give us some insight into what happened 14 billion years ago, before antimatter disappeared, leaving us with the matter we have today,” says Bay. SciFi is a key component for acquiring data at the highest speed, as it includes filters that are designed to preserve only useful data. In an ideal world, the physicists would collect and analyze all of the data without needing to use too many filters. But that would involve a massive amount of data. “We may already be at the limit, because we of course have to save the data somewhere. First we use magnetic storage and then we distribute the data on the LHC GRID, which includes machines in Italy, the Netherlands, Germany, Spain, at CERN, and in France and the UK. Many countries are taking part, and numerous studies on this data are being run simultaneously,” adds Bay. He points to his computer screen: red is used to denote programs that are not working well or those that have been trying for several days to be included among the priorities. Thanks to a new technique developed at EPFL, optical diffraction gratings can now be made out of pure diamond, with their surfaces smoothed down to the very last atom. These new devices can be used to alter the wavelength of high-powered lasers or in cutting-edge spectrographs. A team of EPFL researchers has developed an unconventional way of microscopically cutting diamonds into a particular shape and smoothing them at an atomic level. This new technique, which will be presented at the International Conference on Diamond and Carbon Materials DCM2017 on 5 September, makes it possible to manufacture diffraction gratings out of pure diamond, which has unique properties that are ideal for both spectroscopy and the optical components used in high-powered lasers. Diffraction gratings are made up of parallel grooves that break up light into its spectral components, kind of like a prism. These gratings are usually made out of glass and silicon, materials that have already been used in spectrographs and to alter the color emitted by lasers. The technique developed by the researchers is groundbreaking because it allows them to etch well defined shapes into millimeter sized single-crystal diamond plates, with the grooves separated by just a few microns and with incredibly smooth surfaces. To develop their technique, the researchers used diamonds created synthetically through chemical vapor deposition. This new technology, which was developed using the facilities in the Center of MicroNanoTechnology (CMI), is the subject of a recent patent application. The same principle has already been used using silicon, but it had never before been demonstrated in diamond. In recognition of the importance of this contribution, doctoral student Marcell Kiss has been shortlisted as one of the six finalists of the Young Scholar Award DCM2017. The researchers are collaborating on this development with LakeDiamond SA, a Swiss manufacturing company of high purity single crystal diamond substrates. The project is funded by the Swiss National Science Foundation (SNF) and by the Gebert Rüf Stiftung. EPFL researchers have found a way around what was considered a fundamental limitation of physics for over 100 years. They were able to conceive resonant systems that can store electromagnetic waves over a long period of time while maintaining a broad bandwidth. Their study, which has just been published in Science, opens up a number of doors, particularly in telecommunications. At EPFL, researchers challenge a fundamental law and discover that more electromagnetic energy can be stored in wave-guiding systems than previously thought. The discovery has implications in telecommunications. Working around the fundamental law, they conceived resonant and wave-guiding systems capable of storing energy over a prolonged period while keeping a broad bandwidth. Their trick was to create asymmetric resonant or wave-guiding systems using magnetic fields. The study, which has just been published in Science, was led by Kosmas Tsakmakidis, first at the University of Ottawa and then at EPFL’s Bionanophotonic Systems Laboratory run by Hatice Altug, where the researcher is now doing post-doctoral research. This breakthrough could have a major impact on many fields in engineering and physics. The number of potential applications is close to infinite, with telecommunications, optical detection systems and broadband energy harvesting representing just a few examples. Resonant and wave-guiding systems are present in the vast majority of optical and electronic systems. Their role is to temporarily store energy in the form of electromagnetic waves and then release them. For more than 100 hundred years, these systems were held back by a limitation that was considered to be fundamental: the length of time a wave could be stored was inversely proportional to its bandwidth. This relationship was interpreted to mean that it was impossible to store large amounts of data in resonant or wave-guiding systems over a long period of time because increasing the bandwidth meant decreasing the storage time and quality of storage. This law was first formulated by K. S. Johnson in 1914, at Western Electric Company (the forerunner of Bell Telephone Laboratories). He introduced the concept of the Q factor, according to which a resonator can either store energy for a long time or have a broad bandwidth, but not both at the same time. Increasing the storage time meant decreasing the bandwidth, and vice versa. A small bandwidth means a limited range of frequencies (or ‘colors’) and therefore a limited amount of data. Until now, this concept had never been challenged. Physicists and engineers had always built resonant systems – like those to produce lasers, make electronic circuits and conduct medical diagnoses – with this constraint in mind. But that limitation is now a thing of the past. The researchers came up with a hybrid resonant / wave-guiding system made of a magneto-optic material that, when a magnetic field is applied, is able to stop the wave and store it for a prolonged period, thereby accumulating large amounts of energy. Then when the magnetic field is switched off, the trapped pulse is released. With such asymmetric and non-reciprocal systems, it was possible to store a wave for a very long period of time while also maintaining a large bandwidth. The conventional time-bandwidth limit was even beaten by a factor of 1,000. The scientists further showed that, theoretically, there is no upper ceiling to this limit at all in these asymmetric (non-reciprocal) systems. “It was a moment of revelation when we discovered that these new structures did not feature any time-bandwidth restriction at all. These systems are unlike what we have all been accustomed to for decades, and possibly hundreds of years», says Tsakmakidis, the study’s lead author. “Their superior wave-storage capacity performance could really be an enabler for a range of exciting applications in diverse contemporary and more traditional fields of research.” Hatice Altug adds. With this new technique, it should be possible to improve the process and store large bandwidths of data for prolonged times. Other potential applications include on-chip spectroscopy, broadband light harvesting and energy storage, and broadband optical camouflaging (“invisibility cloaking”). “The reported breakthrough is completely fundamental – we’re giving researchers a new tool. And the number of applications is limited only by one’s imagination,” sums up Tsakmakidis. Researchers from EPFL and Karlsruhe Institute of Technology use a soliton frequency combs from optical microresonators to transmit data at speeds of more than 50 terabits per second. Optical solitons are special wave packages that propagate without changing their shape. They are ubiquitous in nature, and occur in Plasma Physics, water waves to biological systems. While solitons also exist in optical fiber, discovered at Bell labs in the 1980’ies, there technological use so far has been limited. While researchers studied their use for optical communication, eventually the approach was abandoned. Now, a collaboration of a research group at KIT’s Institute of Photonics and Quantum Electronics (IPQ) and Institute of Microstructure Technology (IMT) with EPFL’s Laboratory of Photonics and Quantum Measurements (LPQM) have shown that solitons may experience a comeback: Instead of using a train of soliton pulses in an optical fiber, they generated continuously circulating optical solitons in compact silicon nitride optical microresonators. These continuously circulating solitons lead to broadband optical frequency combs. Two such superimposed frequency combs enabled massive parallel data transmission on 179 wavelength channels at a data rate of more than 50 terabits per second – a record for frequency combs. The work is published in Nature [link is below]. Optical frequency combs, for which John Hall and Theodor W. Hänsch were awarded the Nobel Prize in Physics in 2005, consist of a multitude of neighboring spectral lines, which are aligned on a regular equidistant grid. Traditionally, frequency combs serve as high-precision optical references for measurement of frequencies. The invention of so-called Kerr frequency combs, which are characterized by large optical bandwidths and by line spacings that are optimal for communications, make frequency combs equally well suited for data transmission. Each individual spectral line can be used for transmitting a data signal. In their experiment, the researchers from KIT and EPFL used optical silicon nitride micro-resonators on a photonic chip that can easily be integrated into compact communication systems. For the communications demonstration, two interleaved frequency combs were used to transmit data on 179 individual optical carriers, which completely cover the optical telecommunication C and L bands and allow a transmission of data rate of 55 terabits per second over a distance of 75 kilometers. “This is equivalent to more than five billion phone calls or more than two million HD TV channels. It is the highest data rate ever reached using a frequency comb source in chip format,” explains Christian Koos, professor at KIT’s IPQ and IMT and recipient of a Starting Independent Researcher Grant of the European Research Council (ERC) for his research on optical frequency combs. The components have the potential to reduce the energy consumption of the light source in communication systems drastically. The basis of the researchers’ work are solitons generated in low-loss optical silicon nitride micro-resonators. In these, an optical soliton state was generated for the first time by Kippenberg’s lab at EPFL in 2014. ”The soliton forms through nonlinear processes occurring due to the high intensity of the light field in the micro-resonator” explains Kippenberg. The microresonator is only pumped through a continuous-wave laser from which, by means of the soliton, hundreds of new equidistant laser lines are generated. 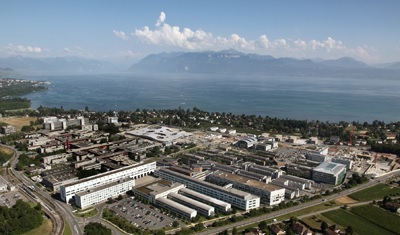 The silicon nitride integrated photonic chips are grown and fabricated in the Center for MicroNanotechnology (CMi) at EPFL. Meanwhile, a startup from LPQM, LiGenTec SA, is also offering access to these photonic integrated circuits to interested academic and industrial research laboratories. The work shows that microresonator soliton frequency comb sources can considerably increase the performance of wavelength division multiplexing (WDM) techniques in optical communications. WDM allows to transmit ultra-high data rates by using a multitude of independent data channels on a single optical waveguide. To this end, the information is encoded on laser light of different wavelengths. For coherent communications, microresonator soliton frequency comb sources can be used not only at the transmitter, but also at the receiver side of WDM systems. The comb sources dramatically increase scalability of the respective systems and enable highly parallel coherent data transmission with light. According to Christian Koos, this is an important step towards highly efficient chip-scale transceivers for future petabit networks. This work was supported by the European Research Council (Starting Grant ‘EnTeraPIC’), the European Union (project BigPipes), the Alfried Krupp von Bohlen und Halbach Foundation, the Karlsruhe School of Optics & Photonics (KSOP), and the Helmholtz International Research School for Teratronics (HIRST), the Erasmus Mundus Doctorate Program Europhotonics, the Deutsche Forschungsgemeinschaft (DFG), the European Space Agency, the US Air Force (Office of Scientific Research), the Swiss National Science Foundation (SNF), and the Defense Advanced Research Program Agency (DARPA) via the program Quantum Assisted Sensing and Readout(QuASAR). Pablo Marin-Palomo, Juned N. Kemal, Maxim Karpov, Arne Kordts, Joerg Pfeifle, Martin H. P. Pfeiffer, Philipp Trocha, Stefan Wolf, Victor Brasch, Miles H. Anderson, Ralf Rosenberger, Kovendhan Vijayan, Wolfgang Freude, Tobias J. Kippenberg, Christian Koos. Microresonator solitons for massively parallel coherent optical communications.Nature 08 June 2017.